The sporadic changes we’ve made during our adventure have created some of the greatest experiences, and now we’re in Asia! Like I explained in our Oslo post, we found ourselves in a situation where we wanted to move on from the cold and costly Europe into a hot and inexpensive Asia. 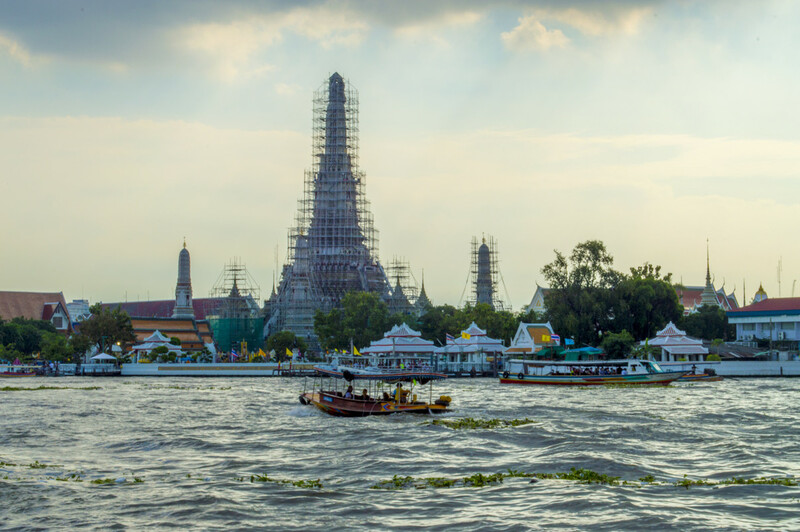 Bangkok seems to be the central hub for cheap flights into Asia, making Thailand one of the most highly visited countries in Asia for backpackers. Once we arrived into Bangkok we shed our winter layers and shipped them back home. Pablo shaved his beard (finally!) and we busted out the flip flops and sunscreen. 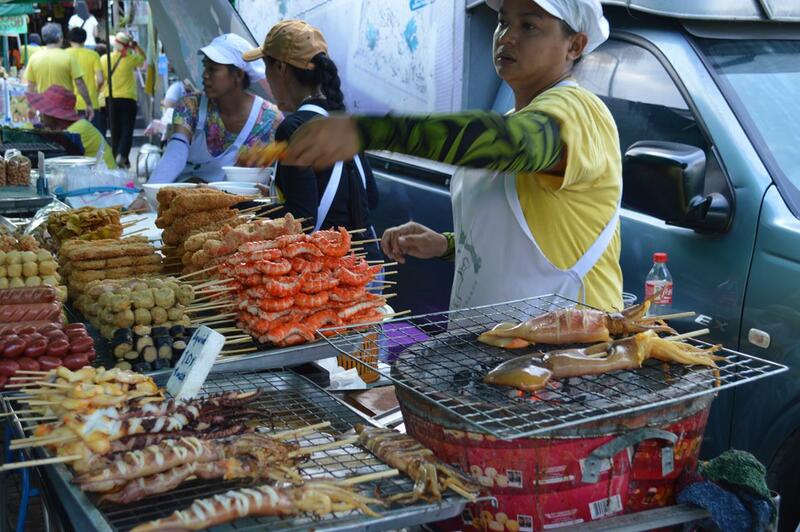 Something we loved right away about Bangkok were the multiple options with food, transportation and things to see. So what do we do when we have so many options? We sample as many as we can! Bangkok is a large city and since we weren’t staying close to the center we had many opportunities to take the bus, water taxi, land taxi, and metro to get in closer (there’s also the sky train and tuk tuks!). We enjoyed taking the water taxi because it was something completely different to us, and the first time we used it it was a bit hectic. The water taxi was already full when it pulled up, but we jumped on the side and waited for a spot to clear as the boat was already headed on it’s way. Luckily people moved over because the nasty water splashes up on the side where we were hanging on. We thought it was a riot, but all the locals were unimpressed. From the airport we took a taxi that only cost 320 BAHT (about $9) and it took us an hour to get to our place (as usual there, a lot of traffic) so that’s not a bad option when departing the airport. It was the first taxi we’ve had during our travels that didn’t hassle us for more money and in the whole process the taxi company is pretty straightforward in what the costs will be. The road traffic on most days takes a long time, like with our first time taking the bus our 30 minute drive took an hour and a half, and we were drenched in sweat before we’d even explored the city. The sky train wasn’t close enough to us to use, but I hear it’s nice and air conditioned, as well as the metro. 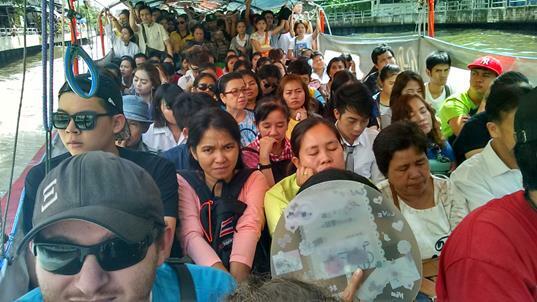 The cheapest transportation are the bus and water taxi, but overall everything is pretty cheap. It’s part of the travel experience to do what the locals do so give all the different transports a try! We loved having food carts all over the city so it was simple to find something to eat instead of searching forever, and with a good amount of options. It seems like a matter of luck whether you’ll get sick or not from the food, but we used what tactics we could. We made sure to get food from places where several locals were buying from and that didn’t have raw meat sitting out. Besides that, there was no point in dwelling on what was beyond our control so we dived in and tried everything, everywhere! The one exception was trying something from the bug cart stocked with mealworms, crickets and everything I’d eat if I were on fear factor. 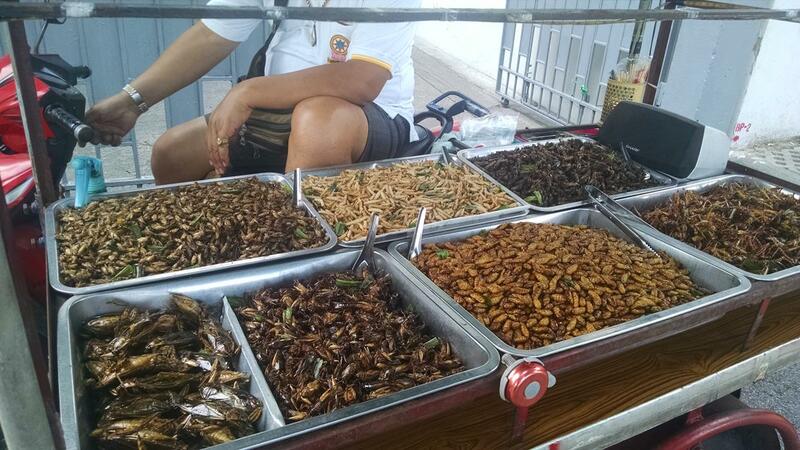 I admit I was curious, but I can go search for some free bugs elsewhere and there were so many DELICIOUS foods to try! We were so excited to see the different architecture of Asia including their gorgeous temples. We were still feeling groggy from the time change so we stretched our legs walking around the Wat Ratchanatda School and then to the Wat Suthat. 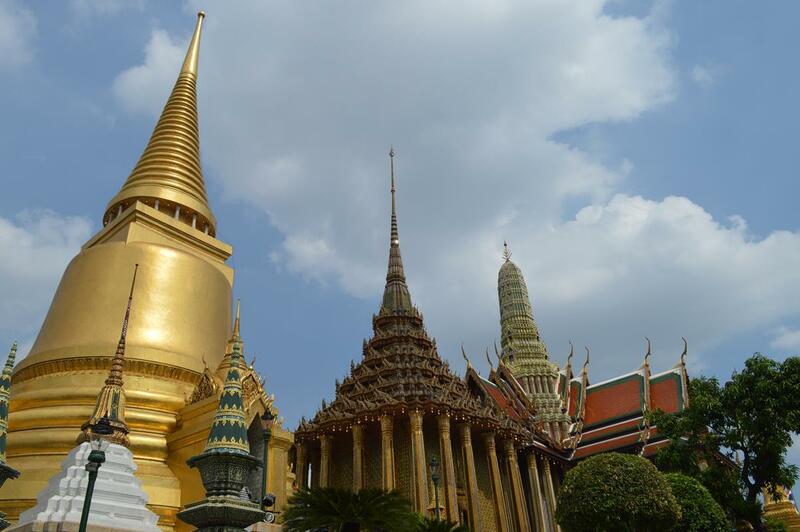 On another day we visited the Grand Palace and Wat Phra Kaew with it’s amazing temples and interesting museums. To enter the Palace it’s 500 BAHT per person so not the cheapest because it’s something every tourist is recommend to do while in Bangkok, and for good reason. We weaved through the crowds and pretty much gawked at every Temple, paintings and statues there. Make sure to dress appropriately, no sleeveless or see through shirts and nothing exposed above the knee. Flip flops are fine and preferable for easy removal before entering the temples. We did a lot of walking so flip flops weren’t extremely comfortable, but it would’ve been too hot for tennis shoes. 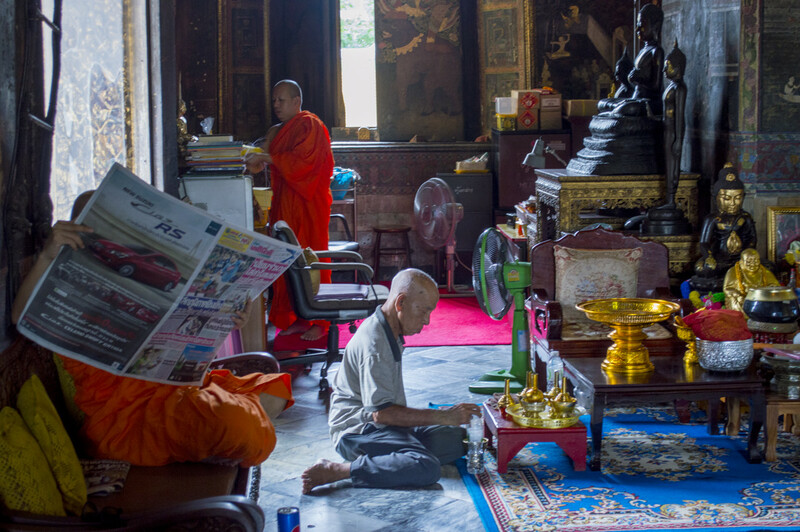 There are monks everywhere in Bangkok’s temples, please respect their culture and their standards. Visiting the Grand Palace and everything could’ve been enough for one day and I recommend not doing more after, but since we’re overzealous we added more into the day. We meandered over to the river to view the Temple of Dawn, which even under construction looked beautiful. Down the street was the Wat Pho where we visited it’s famous reclining Buddha, which almost seemed too big for the building. There was construction on the feet while we were there, but hey, everybody needs some foot work done at some point, right? 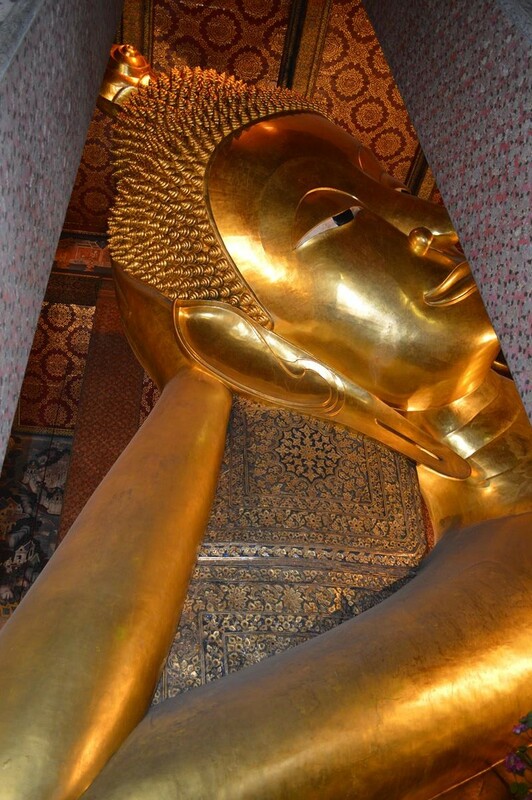 Even after a long day and in our tired state we were still wanting to see every corner of the Wat Pho because there’s so much to see, but we could’ve gone for a foot massage at that point. Many tourists must feel like that after exploring the city and conveniently enough there were massage places everywhere. Everywhere we went in Bangkok there were pictures of the king on billboards and in front of temples. We were curious about him and found out some interesting things. The King is the longest reigning monarch in Thailand as well as the richest monarch in the world, with an estimated wealth of $30 billion. 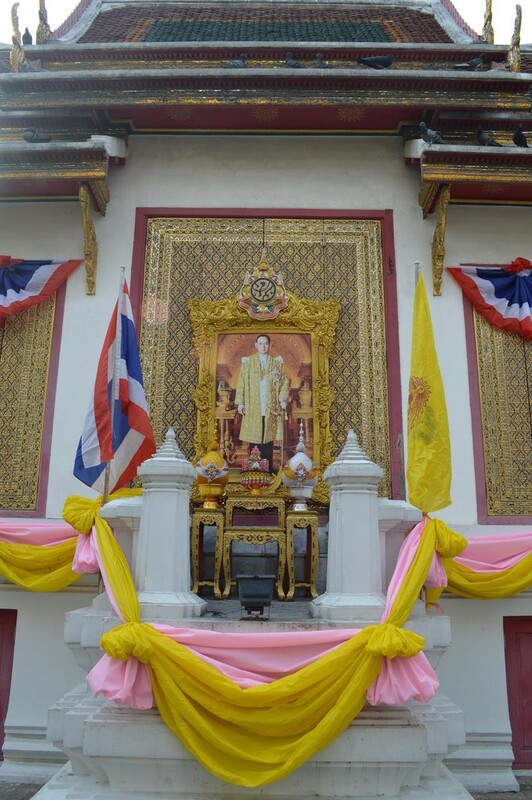 We were in Bangkok during Father’s day, which is the king’s birthday, and everyone was encouraged to wear yellow, because every day of the week has a color and his birth day color is yellow (if that makes sense). Of course, not being locals we missed the memo and there were plenty of people wearing yellow “Bike For Dad” T-shirts because there was a cycling campaign for him on that day as well. Probably missing a lot of details in that, but interesting stuff to learn while traveling! We’re actually not big shoppers, but on top of everything else, Bangkok had several shops with something for everyone in them. Something we’d been recommended and found fun despite our lack of enthusiasm for shopping was to go to the chatuchak market. Chatuchak is an enormous weekend market that you could spend all day in and only get a small sample of it all. We weaved through the maze of vendors enjoying the selections and left with a couple of bargained items in tow. If you miss the Chatuchak Market there’s a ton of other shopping opportunities in the Platinum mall, or the Central World (but we found prices here to be the same as U.S. mall prices). You’ll find on average the cheapest deals with the vendors on the streets and in outdoor markets. 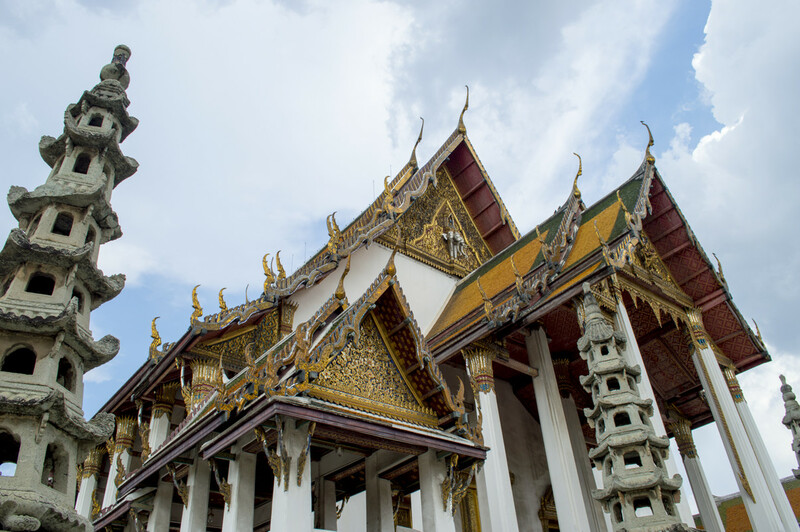 Bangkok was an exciting city to visit and if you’re traveling to Thailand you should try to fit in some time to explore this amazing city! We’re so excited to explore more of Asia and to learn of the culture and customs. Feel free to email us or comment below with any travel advice or experiences you’ve had from traveling through Asia, we’d love to hear them! Would you eat something from the bug cart?